Enter our quarterly prize draw today! We run four Prize Draws in Ireland and four in the UK throughout the year. It does not matter where you live, you can now enter these draws online. 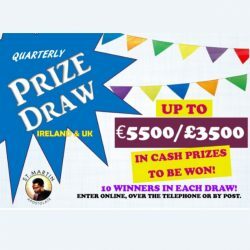 We have up to €5500 / £3500 in cash prizes to give away in each draw. TOP PRIZE of €2,000 or £1,000. Enter now below to be in with a chance to win.